Reverend John Slade, Methodist minister, came to the Wiregrass to take up preaching around 1821 and he was a familiar figure throughout South Georgia and Northern Florida. “He was tall, with an athletic build, high forehead and a strong, clear, musical voice. He was described as being very striking in appearance, and it was said that he possessed an intellect of high order and that he resembled Andrew Jackson,” according to the history of Wakulla Methodist Church where he later served as pastor. 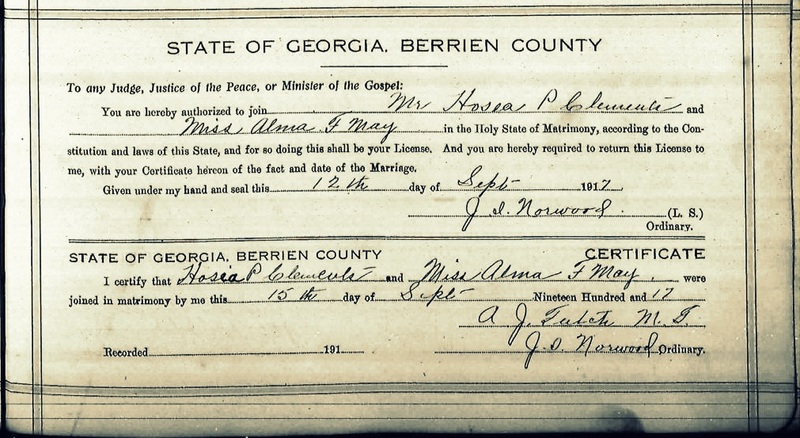 On July 31, 1825 Reverend Slade married a Tallahassee, FL girl whom descendants say was Mary Bell. Her brothers founded the town of Bellville, TX. In 1826 Reverend Slade rode the Tallahassee Mission which encompassed a vast area of north Florida and South Georgia, including the newly created Lowndes County. Lowndes then included the areas of present day Berrien, Lanier, Brooks, Cook and Tift counties.There were few settlers and very few, if any, churches in this territory. About 1832, a Methodist church was established at the site of Troupville, Lowndes county, but the population of Methodist churches in Lowndes was not sufficient to sustain a pastor preaching on a regular circuit until 1841. 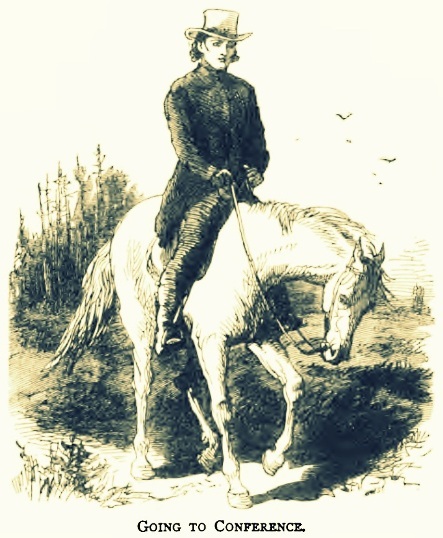 In 1847 and 1854 Reverend Slade was the circuit-rider on the Troupville circuit. Reverend John Slade, along with Reverend Fleming Bates and Thomas Ellis, witnessed the Last Will and Testament of John Hagan, dated Oct. 28, 1822 and probated Nov. 4, 1822, Camden County, GA. Reverend Bates was an Elder in the Primitive Baptist faith, and of the original presbytery that constituted Union Church, the mother of all the Primitive Baptist churches in this section. The Executors of Hagan’s estate were Malachi Hagan and William Anderson Knight, Primitive Baptist and father of Ray City settler Levi J. Knight. In The History of Georgia Methodism from 1786 to 1866, Reverend George Smith writes about Slade’s first experience as a circuit riding preacher. …a mission in the southwest of the new purchase was organized, to which two preachers were sent, John J. Triggs and John Slade. To reach this appointment they had to ride through the Indian nation for a long distance, and had to ride in all four hundred miles from the conference. Triggs had gone out from the last conference, to organize the mission, and now an assistant was sent to him, John Slade, who was recognized as the father of Florida Methodism, though he was not the first to preach the Gospel in the new territory. He was born in South Carolina, and was now thirty-three years old. He had travelled one year as a supply before 1823, but now for the first time entered the travelling connection, and was appointed to the Chattahoochee Mission. After travelling about seven years he located, and gave useful labor as a local preacher, to the building up of the Church in Florida. He re- entered the Florida Conference in 1845, and travelled in it till his death in 1854. He was a fine specimen of a man. He was tall, well proportioned, with a fine face. He sang well and preached with power. The country in which Triggs and Slade preached was in the corner of three States, Georgia, Alabama and Florida. Their circuit was an immense one. The people were perhaps the rudest in the States, and though now and then, on the better lands, they found some thrifty settlers, generally they were the poorest and most ignorant class of stock-raisers. Fredrick Smallwood, church historian for the Attapulgus, GA United Methodist Church wrote of Reverend Slade in 2002. Slade is believed to have founded the church at Attapulgus about 1830. Reverend Thomas W. Ellis, Worshipful Master; Ephriam H. Platt, Senior Warden; Benjamin C. Clay, Junior Warden; Charles H. Howell, Secretary; John Brown, Treasurer; William H. Dasher, Senior Deacon; J. T. C. Adams, Junior Deacon; John B. Cashan, Tyler. Other members in addition to Reverend Slade were: Norman Campbell, William C. Newbern, William T. Roberts, James H. Carroll, Adam Graham, Thomas Moore, William Dees, Daniel Mathis, Thomas D. Wilkes, S. D. Smith, James Harrell, J. N. Waddy. William J. Mabry, George Brown, William Jones, J. C. Pautelle, J. R. M. Smith, Reverend F. R. C. Ellis, Robert B. Hester, Andrew J. Liles, William Godfrey, W. D. M. Howell, Hustice Moore, J. Harris, W. H. Carter, William A. Sanford, Willis Allen, Jeremiah Williams, William A. Carter, John R. Walker, William D. Martin, J. E. Stephens, R. W. Leverertt, L. M. Ayers, S. Manning, James Carter, Willis Roland, John W. Clark, James A. Darsey, the Entered Apprentices Judge Richard A. Peeples, William Ashley, J. J. Goldwire, snd Fellowcrafts William T. Roberts and Moses Smith. One of Slade’s fellow lodge members at Troupville was William J. Mabry, who in 1856 moved to Nashville, GA, seat of the newly created Berrien County, where he built the first Berrien court house in 1857 and also became the first Worshipful Master of Duncan Lodge No. 3. Later, the St. John the Baptist Lodge No. 184 was moved from Troupville to Valdosta, GA. In December, 1861 St. John the Baptist Lodge A. F. M. of Valdosta, elected the following officers; S. A. Smith, Jr., W. M.; S. W. Baker, J. W.; W. D. Howell, J. W.; J. M. Howell, Treasurer; Charles McKinnon, Secretary; R. T. Roberds, S. D.; Willis Allen, J. D., and H. P. Morris, Tyler. John Slade was born on Beech Branch, Beaufort District, S. C, on the 7th of April, 1790. He was brought up in comparative obscurity, with very limited advantages for education. When he was about thirty years of age, he became hopefully a subject of renewing grace, and connected himself with the Methodist Episcopal Church, in Camden County, Ga. He attributed his conversion, instrumentally, to the influence of his grandmother, an eminently pious person, who took great pains to give a right direction to his youthful mind, not only instructing him in the truths of religion, but often taking him with her, when he was a mere child, into the place of her private devotions, and earnestly supplicating for him the blessing of a renovated heart. After he had reached manhood, the good seed which had been thus early sown, germinated, and ultimately matured into a rich harvest of Christian virtues and graces. Soon after he joined the Church, his brethren were so much impressed by his talents and piety that they gave him license to exhort. In 1822, he commenced his labours with the Rev. John J. Triggs, who had been appointed to the ” Early Mission and adjacent settlements.” After being thus engaged a short time, the Church licensed him to preach, and recommended him to the travelling connection. In 1823, he was admitted on trial in the South Carolina Conference, and appointed junior preacher (the Rev. J. J. Triggs, in charge) on the Chatahoochee Mission, embracing a large field in the Southwestern part of Georgia, and a portion of Alabama. In 1824, he was appointed in charge of the Early Mission, embracing in part the ground occupied the previous year, and quite an extent of territory in Florida. In 1825, he was admitted to full connection in the South Carolina Conference, ordained a Deacon by Bishop Roberts, and appointed in charge of the Appling circuit, in the Southeastern part of Georgia. On the 31st of July of this year he was married. In 1826, he travelled the Tallahassee Mission, embracing a portion of Southern Georgia, and a large territory of wilderness country in Florida. In 1827, he was appointed in charge of the Choopee circuit, in Georgia. On the 10th of February, 1828, he was ordained an Elder by Bishop Soule, at Catuden, S. C. His health having now become much impaired by manifold labours and exposures, he was placed on the superannuated list. This relation he sustained two years. At the Conference held at Columbia, S. C, in January, 1830, he asked for and obtained a location. In this capacity he laboured in the Southern part of Georgia and in Florida, struggling not only with feeble health but with poverty, for fifteen years. In 1845, his health was so far restored that, upon the organization of the Florida Conference, in Tallahassee, he was re-admitted into the travelling connection, and appointed in charge of the Bainbridge circuit. In 1846, he travelled the Blakeley circuit; in 1847, the Troupville circuit; in 1848, the Warrior Mission. In 1849, he was returned to the Bainbridge circuit. In 1850, he was in charge of the Irwin circuit. In 1851, he travelled the Holmesville Mission. In 1852, he was appointed in charge of the Wakulla circuit. In 1853, he was returned to the Troupville circuit. In 1854, he was appointed to the Thomasville circuit, where he closed his labours and his life. On the 17th of June, 1854, he attended an appointment at Spring Hill, and, while taking his horse from his buggy in the church-yard, was suddenly stricken down with paralysis. It was hoped, for some time, that he might recover; and, on the 24th, he preached a short sermon to his congregation, from Rev. xv, 2, 3. The effort completely prostrated him, so that it now became manifest to all that his course was nearly run. He died the next evening, ” strong in faith, giving glory to God.” He was in the sixty-fifth year of his age, and had spent thirty-four years in the vocation of a Christian minister. He left a widow and two daughters. FROM THE REV. PEYTON P. SMITH OF THE FLORIDA CONFERENCE. Albany, Ga., January 24, 1860. Rev. and Dear Sir: My personal acquaintance with the Rev. John Slade commenced in Tallahassee, Fla., in the year 1839. From that time until his death, I was in the most intimate relations with him, both as a man and a minister. As a preacher in charge, he frequently served on circuits in districts over which I presided. In his travels, he often lodged under my roof, and knelt with me and mine around the family altar. I knew him long—I knew him well; and I knew him only to love him as a friend and faithful brother in the Lord. In personal appearance John Slade was a noble specimen of a man. He was full six feet, two inches in height, of a large muscular frame, well-proportioned, strong and athletic, and weighing, in his prime, at least two hundred pounds. When I first saw him, he was considerably advanced in life, and by no means in robust health; the consequence of which was that his face presented a somewhat bony appearance, though his countenance was still ruddy, and his form dignified and commanding. He had a large, well-developed head, with a voice for both public speaking and singing, not inferior, on the whole, to that of any man whom I have ever known. In his general aspect and bearing, he always reminded me of the likenesses of General Jackson—he looked as though he was every way competent to be placed at the head of an army. Mr. Slade possessed an intellect of a high order; and if he had enjoyed the advantages of a thorough intellectual training, he might have reached an eminence which was gained by few of his contemporaries. He possessed great courage, both physical and moral, and no privations and hardships were so great, and no dangers so appalling, but that he resolutely, cheerfully encountered them, whenever he met them in what he believed to be the path of duty. As a Preacher, Mr. Slade adhered most closely to what he believed to be the teachings of the Bible. His views were strictly in accordance with those which form the accredited system of the Methodist Church; and he knew how to sustain them by forcible and appropriate argument. I cannot say that he devoted as much time to theological reading as some of his brethren; and yet his preaching betrayed no lack of familiarity with theological subjects. He wielded the sword of the Spirit with great energy, and sometimes with prodigious effect. I remember hearing him preach once at a Camp-meeting in Hamilton County, Fla., on the ” Divinity of Christ, and the triumphs of his Gospel;” and there was a sublimity, both in what he said and in his manner of saying it, worthy of the most distinguished of our pulpit orators. Not unfrequently his sermons carried with them revival fire, and would strike conviction to many a previously careless heart. In 1840, while a local preacher, he held a meeting, in company with another preacher, which continued for ten days. The greater part of the preaching devolved upon him; and his sermons, though exceedingly plain, were characterized by great power, and breathed a truly apostolic spirit. Not only did many of the common people who listened to them receive the Gospel gladly, but not a small number of the rich, the proud, the fashionable, were deeply impressed under them, and bowed in penitence at the foot of the Cross. After the meeting closed, he baptized twenty-seven by affusion, and seventeen by immersion. But the very next day he was overtaken by a severe bodily affliction, by means of which he was taken off from his labours for a long time. Soon after his recovery, an incident occurred, which may be referred to as illustrating his great zeal in the cause of his Master. He met a congregation, according to appointment, but they had failed to get their house covered. Not at all disconcerted by the circumstance, he stood, Bible in hand, beneath the burning rays of a summer’s sun, and preached Christ crucified to a handful of sinners, with three or four Christians, with as much fervour as if he had been addressing a large congregation. On this spot there now stands a large church edifice, with a proportionally large membership. Some who heard him on that occasion, still live, to testify to the unction with which he spoke, and to cherish his faithful labours in their grateful remembrances. I will only add that Mr. Slade was distinguished for his humility, his selfdenial, his devotedness to Christ, his fidelity to all his Christian obligations. He cared not for the wealth or honour of the world, but was willing to ” count all things but loss for the excellency of the knowledge of Christ Jesus his Lord.” His great desire was to do good; and to this he devoted all his powers of both body and mind. Salvation was his theme on the road, around the fireside, wherever he could gain the ear of a human being. He lived preeminently to glorify his Master, and the light of his example still lingers on earth, though he has gone to his reward. St. John’s Day was held at Ray City last Sunday. Prof. C.O. Davis was the speaker. Prof. Davis is the Deputy Grand Master of the Masonic Grand Lodge of Georgia. Masons have been a part of Ray City, GA history since the beginning of the town. The lodge in Ray City was constituted in 1909. In 1910, as the Methodist church was being organized in Ray City, a revival was held in the Masonic hall. 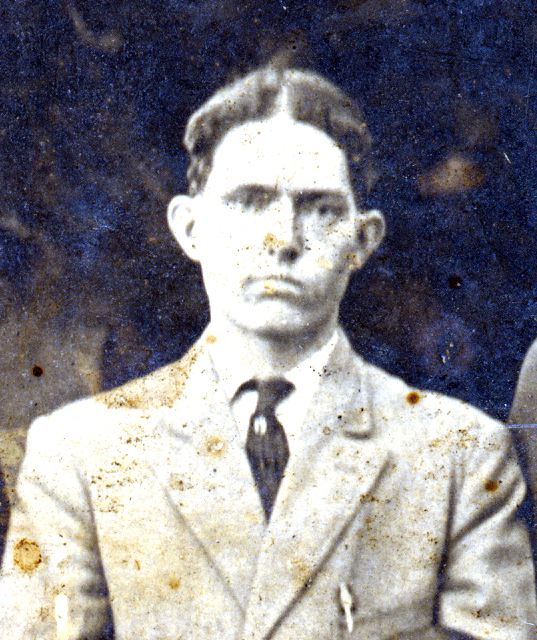 Ray City founder Thomas M. Ray was a Mason, as were Perry Thomas Knight, A. J. Pert, James Henry Swindle, Caswell Yawn, Dr. Pierce Hubert, Hod Clements, D. Edwin Griner and Lucius Jordan Clements among others. 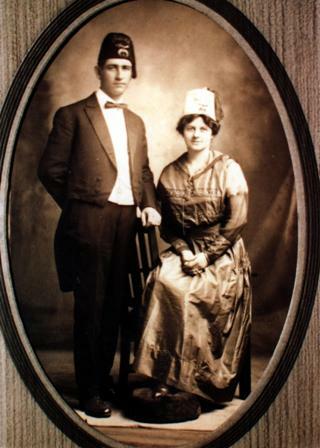 In 1909, Lacy Lester Shaw served treasurer of Ray City lodge No. 553. From 1858 to 1878 Hardeman Sirmans was a member Butler Lodge, No. 211 in Milltown. At the time of his death in 1907 Judge A. H. Hansell, of the Southern Circuit, was the oldest living Mason in the state of Georgia. 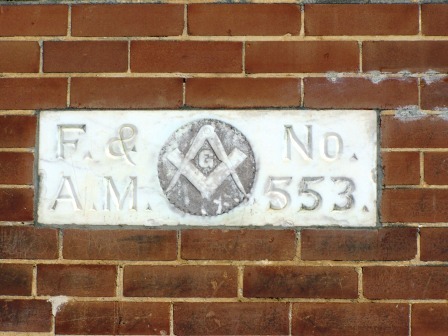 A marble stone set in the only remaining commercial brick building in Ray City, designates it as the “Masonic Building,” one time home of the Free & Accepted Masons Lodge No. 553. At Brian Brown’s Vanishing South Georgia blog, Ray City residents have commented on the history of this building, which once was home to the Ray City drugstore and later, the Victory Soda Shop. The Free and Accepted Masons were active in the Wiregrass long before the formation of the lodge at Ray City in 1909. Lodge No. 211 was incorporated 50 years earlier at Milltown (nka Lakeland, GA) in 1858. Somewhat earlier, St. John the Baptist Lodge No. 184 was constituted at Troupville on November 2, 1854. Circuit riding Methodist reverend John Slade was a member there, as were Norman Campbell, and William C. Newbern. Andrew J. Liles, postmaster of Milltown, was a member. The Masonic lodge at old Troupville met on the first and third Tuesday nights upstairs in Swains Hotel, situated on the banks of Little River and owned by Morgan G. Swain. William T. Roberts, James H. Carroll, Adam Graham, Thomas Moore, William Dees, Daniel Mathis, Thomas D. Wilkes, S. D. Smith, James Harrell, J. N. Waddy. William J. Mabry, George Brown, William Jones, J. C. Pautelle, J. R. M. Smith, Reverend F. R. C. Ellis, Robert B. Hester, , William Godfrey, W. D. M. Howell, Hustice Moore, J. Harris, W. H. Carter, William A. Sanford, Willis Allen, Jeremiah Williams, William A. Carter, John R. Walker, William D. Martin, J. E. Stephens, R. W. Leverett, L. M. Ayers, S. Manning, James Carter, Willis Roland, John W. Clark, James A. Darsey, the Entered Apprentices Judge Richard A. Peeples, William Ashley, J. J. Goldwire, snd Fellowcrafts William T. Roberts and Moses Smith. Troupville lodge member William J. Mabry, moved in 1856 to Nashville, GA, seat of the newly created Berrien County, where he built the first Berrien court house in 1857 and also became the first Worshipful Master of Duncan Lodge No. 3. Later, the St. John the Baptist Lodge No. 184 was moved from Troupville to Valdosta, GA.
A post on the Masonic Traveler Blog by mason and artist, Greg Stewart explains the significance of Saint John the Baptist Day. The Saint’s Johns appear to Freemasons in several places in our catechisms. Their proximity and use in our rituals have been questioned for many years as to their use and placement. Looked at together, saint John the Baptist and St. John the Evangelist serve to represent the balance in Masonry between zeal for the fraternity and learned equilibrium. The Saints John, stand in perfect parallel harmony representing that balance. From a historical approach, The Saint John’s festival is said to be a widely celebrated Masonic holiday. Traditionally June 24th (or the summer Solstice) is taken to be John the Baptist’s day, which is celebrated in many cultures around the world. According to McCoy’s Masonic Dictionary, the Festival of St. John in summer is a duty of every Mason to participate in, and should serve to be a renewal and strengthening of fraternal ties and a celebration of Masonry from “olden-times”. It functions as a connection between the past and the future. More on St. John’s Day via Masonic Traveler: Saint John the Baptist Day, Duality in One. June 24th.